In what can only be described as a demonstration of how broken, incompetent, and criminally negligent the leadership of U.S. government is when it comes to the security of America and its citizens, the Director of the FBI, Robert Mueller III, testified before the U.S. Congress that he is NOT aware the mosque (Islamic Society of Boston or ISB) at which the Boston Marathon bombers (Tsarnaev brothers) attended was founded by Al Qaeda financier Abdurahman Alamoudi. That also means Director Mueller is not aware a founding trustee of ISB is Yousef Qaradawi, the most prominent Sunni Jurist in the world who is also one of the most powerful Muslim Brothers in the World. 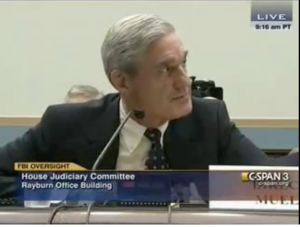 Nor is Mr. Mueller likely aware the Muslim American Society (MB) is partnered with the ISB. In one of the largest terrorism investigations in American history since 9/11, the FBI Director admitted he didn’t know a critical detail linking the radicalization of the jihadis involved to Al Qaeda. Abdurahman Alamoudi is a Muslim Brother, a Hamas operative, and a financier for Al Qaeda. He pled guilty in the Eastern District of Virginia in 2004 after being arrested in 2003 in London with $340,000 he received from Libya for the global jihad. He now sits in federal prison. Alamoudi was the Islamic Advisor to President Clinton, was a Good WIll Ambassador for the State Department, and created the Muslim Chaplain Program for the Department of Defense. But I suspect the FBI Director doesn’t know any of that either. Americans are beginning to comprehend the factual basis that reveals the vast majority of Islamic organizations in America are controlled by the Muslim Brotherhood – our enemy. The question most asked by many in the U.S. today is: “How is it possible our leaders aren’t doing anything about this.” Now we know the answer. Our leaders are, apparently, completely clueless. This, by the way, is the intentional outcome of the Muslim Brotherhood’s long-term information operation in America – their Civilization Jihad seems to be successful. An operation of which the FBI Director is surely unaware.